My brother goes to school in Milwaukee so he was only back at my parent’s house for a week between the spring semester and starting his summer internship back in Milwaukee. I took a day out of work to spend some time with him during his quick stay. We spent the afternoon at an awesome coffee shop in Providence, Cafe Zog, before hitting Whole Foods to get some groceries for a dinner we prepared for my parents, sister, nephews, and grandmothers that night. 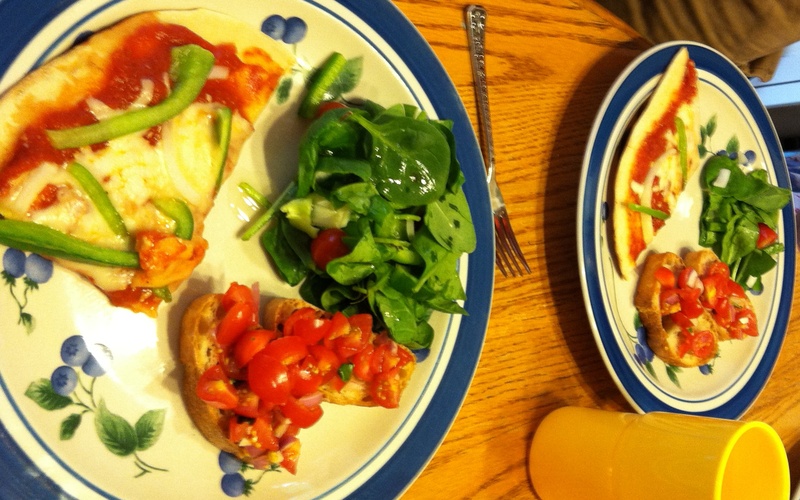 We debated dinner options while we browsed at Whole Foods and we decided on making pizzas, bruschetta, and salad. We’d never made brushetta before, but we googled a few recipes, combined some of their ingredients and ideas, and came up with something easy. Even better, it turned out to be delicious. 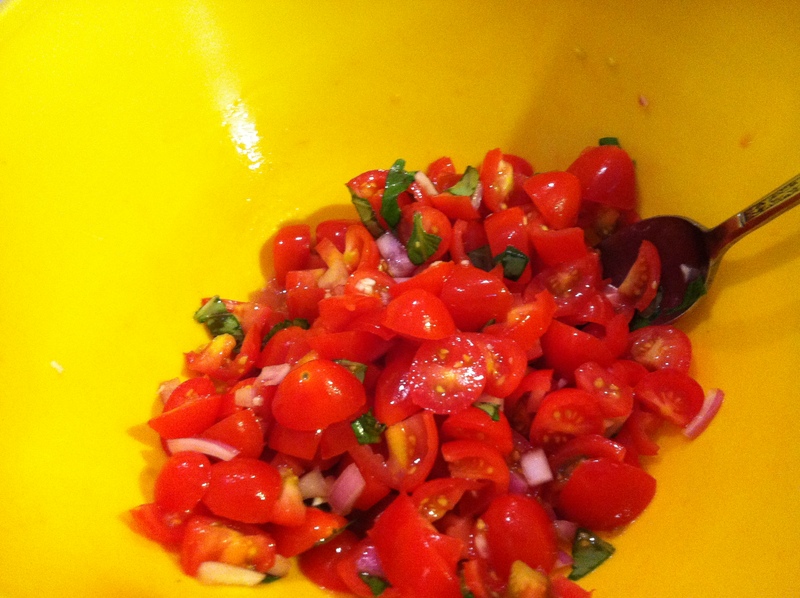 Chop the cherry tomatoes into small pieces, then add the diced red onion and the chopped basil leaves. In a small bowl combine the olive oil and balsamic vinegar and whisk together. Add the oil and vinegar mixture to the tomato and onion mixture and stir well so the tomatoes are evenly coated with the liquid. 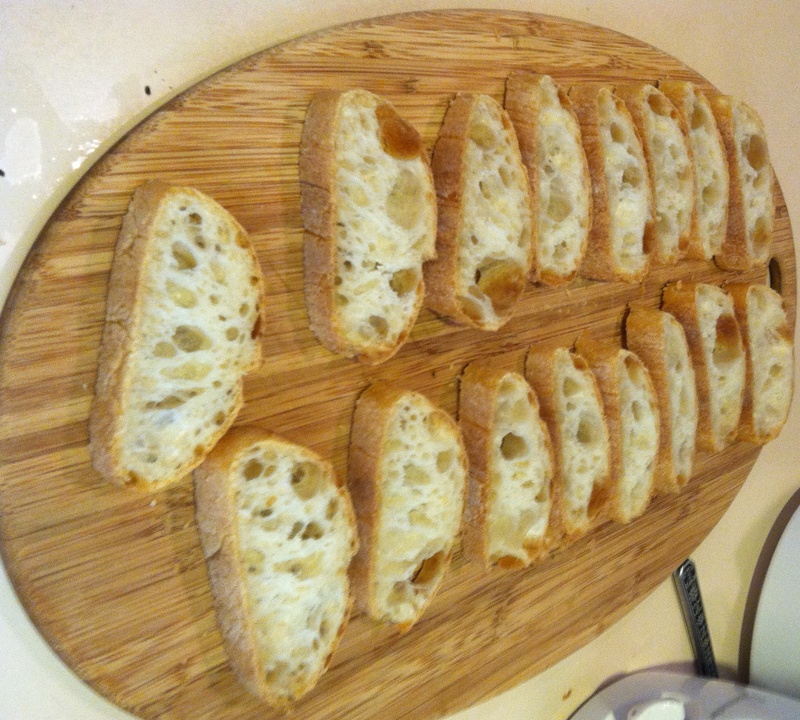 Cut the french bread into 1/2 inch thick pieces. Brush some olive oil on one side of each piece and place the bread oil side own on a baking sheet. Bake the slices of bread in a 450 degree oven for 5 or 6 minutes, or until it becomes golden brown. When the bread is toasted, dish the tomato mix on top of each piece. Let the bruschetta sit for a bit to soften the hard bread. The pizzas we made also came out terrific. Take a look at our finished meal. Delicious!